by Dave from The Longest Way Home ~ October 10th, 2018. Published in: Travel blog » Nepal. Is there anywhere else in the world that can rival Thamel for its addictive kaleidoscope of sensory bombardment? The moment you enter its hallowed boundaries you are assaulted from all sides in ways that either want to make you run for your hotel to take stock on what you just entered into. Or, as happens to many a traveler, bask in its frenzy. Love it or hate it Kathmandu’s quintessential hub of guesthouses, trekking agents, souvenir stores, restaurants and cafes is near on impossible to avoid and neither should you try to avoid it. Thamel is one of those “once in a lifetime” experiences every one should try at least once. 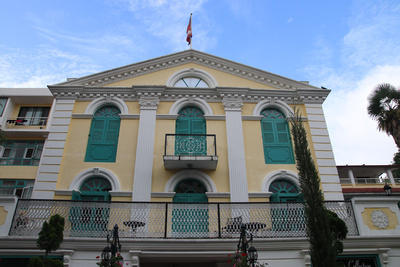 At the center of Thamel sits one of it’s most iconic buildings, Kathmandu Guest House. Credited for being the first guesthouse to open in Thamel and the one that kickstarted tourism in this area of Kathmandu. 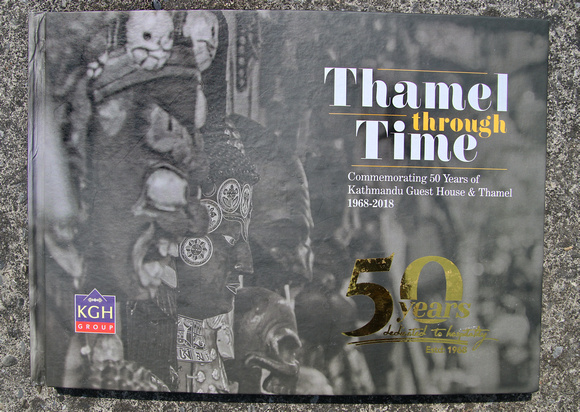 In 2018 Kathmandu Guest House celebrated it’s 50th anniversary. As part of the celebration they published a book “Thamel Through Time” which takes a historic look at Thamel from its ancient origins all the way to its modern status. Along the way Thamel Through Time shows us how Kathmandu Guest House entered into history within Thamel, how it got started, the troubles, the celebrations, the devastating earthquake and the future. Although classed as a coffee table book, Thamel Through Time gives one a unique, factual and fascinating historic look at Thamel by way of photographs and text. Written by Benjamin Linder as part of his PhD and conceptualized by Shaguni Shakya its enjoyably different from the many other books on Thamel and indeed Kathmandu. Linder tackles the academic side of historical cultural change while blending it with the accompanying photographs which he himself admits can be far more descriptive of Thamel’s uniqueness in the world. It’s through these two methodologies that we get a great perspective on the changes Thamel has gone thorough. 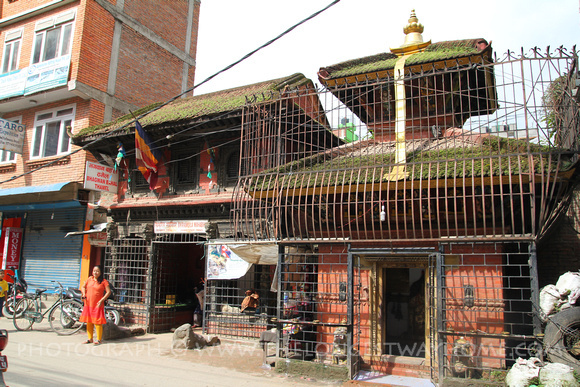 Shaguni Sakya and the entire Sakya family who run Kathmandu Guest House provide insider knowledge on the history of Kathmandu Guest House role in Thamel that only the founders family could tell. 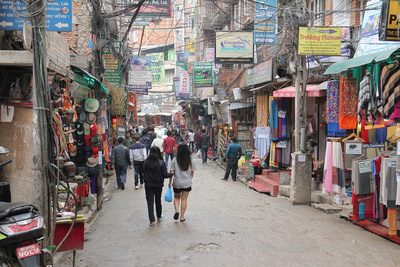 Moreover, as the family has deep ties with heritage, preservation and community empowerment within Thamel. There are stories and historic references in this book which you won’t find anywhere else. If you’ve read my Thamel Heritage Walk guide you’ll already know that Thamel was once known as Tha Bahil or Tha Bitha, a monastic area about 1000 years ago. Thamel Through Time starts here with the Newar community and the still standing Bhagwan Bahal, one of many monastries and Temples in Thamel. Personally I found this early part to be one of the highlights of the book. I won’t reveal nor spoil the revelations on what is written about Bhagwan Bahal here only to tantalize you with the fact that the oldest (claimed) manuscript resides here with the priests. Within this manuscript may well be text from Manjushree himself (creator of Kathmandu Valley). The book then dives into the Rana period just before tourism came to Nepal. It’s here that the book moves up a gear with a wonderful look at Rana Palaces, why they came to be and how they fell into disrepair. This then leads to the founding of Kathmandu Guest House by Karna Sakya and the birth of tourism in Kathmandu. The book delves into the relatively modern explosion of tourism, trekking and mountaineering arriving into Nepal with delightful stories from the Sakya family. The 2015 earthquake was devastating to Nepal. Kathmandu Guest House was not spared either. In this part of the book we learn about how parts were damaged, restored and rebuilt. There are touching stories of Rajan Sakya, his father and family during this period too. Finally we learn about what and where Thamel will develop into. I touch on this with my article on Ten years of change in Thamel. I met with Shaguni Sakya last week. We were discussing heritage as we normally do about not just Thamel but all Kathmandu. Modest about Thamel Though Time only having 128 pages Shaguni emphasized it was a coffee table book, which it is. However, compared to other heritage books I felt the book covers unique insights many others do not. Thamel Through Time also has a sense of personality, closeness and family about it. That’s not hard to explain when you realize just how Kathmandu Guest House itself is historically important to Thamel. It’s these personal stories throughout the book that gives the history within it an easy anchor to hold on to as we discover the changes of Thamel throughout the years. 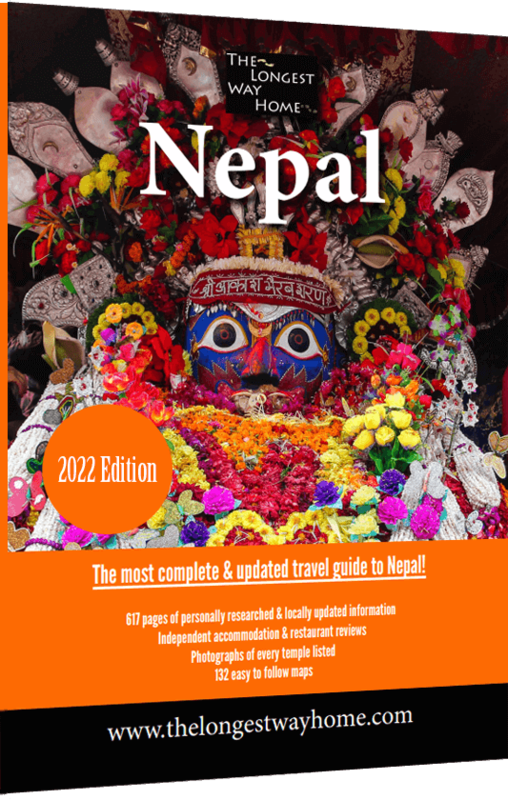 This is a unique coffee table book which blends centuries of history within Thamel with modern day change and the rise of Kathmandu Guest House. 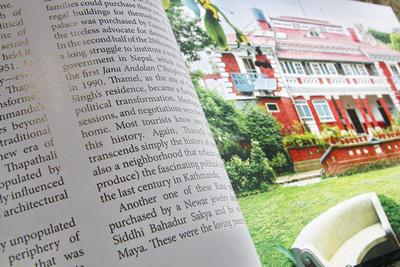 For those that have stayed in the historic Kathmandu Guest House and feel its vibe then the book is a given. For those who have or are planning to visit Kathmandu then this book provides a personal look at this characteristic kaleidescope of a neighborhood known as Thamel. Thamel Though Time is available in all good bookshops in Kathmandu. (previous post) « Is it easy to travel around Nepal? I stayed at the Kathmandu Guest House almost 20 years ago for two weeks and loved it. I would stay there again in a heartbeat. Happy to hear it’s still around and thriving. Yes, it is a unique guesthouse in Thamel. They are now building a new annex. Great to see people active in Nepal’s heritage. It’s a shame that its rarely highlighted (aside from here). I’m not sure why Nepal just keeps pushing Everest like no tomorrow when they have a wealth of history to show off! Yes I agree. It will take quite some time for Nepal’s heritage to be highlighted like the mountains. Infrastructure and a diverse population are some of the factors. I believe it is only available in Nepal. However if you contact Kathmandu Guest House directly they may be able to ship it out to you. Great to see the Kathmandu Guest House again! Great place to stay in Thamel. It’s doing well in Thamel. Dave I really do not think any place can rival it. We spent every day in Thamel during our 2013 Kathmandu trip. For food, or walking, the sensory overload was fabulous. I adore the place. Comfy-cozy. Cool book. Glad you enjoyed Thamel Ryan.